COLLEGE PARK, Ga. (CNS) — Atlanta Archbishop Wilton D. Gregory urged the thousands attending the 2017 Eucharistic Congress to make serving the Lord the foundation of their lives as Joshua and his family did. Joshua’s declaration, “As for me and my house, we will serve the Lord,” was the theme of the Atlanta Archdiocese’s congress, held in mid-June at the Georgia International Convention Center in College Park. “My hope is that this is your determination — your personal goal in these difficult and very challenging times in which we live,” Archbishop Gregory said. The presence of God is the solid rock in difficult times, he said June 17. “We need the Eucharist because it is Christ living within us who equips us to live with faith and courage in this unpredictable and sometimes very unfriendly world,” Archbishop Gregory said. Believed to be the largest assembly of Catholics in the Southeast, the congress focuses upon the true presence of Jesus Christ in the Eucharist and brings together people from all the quadrants, cultures and languages of the archdiocese as the one body of Christ in middle and north Georgia. This year’s June 16-17 congress had as its vision for attendees living lives of faith, sustained by the divine meal of the Eucharist. June 18 was the feast of the Blood and Body of Christ, known as Corpus Christi. 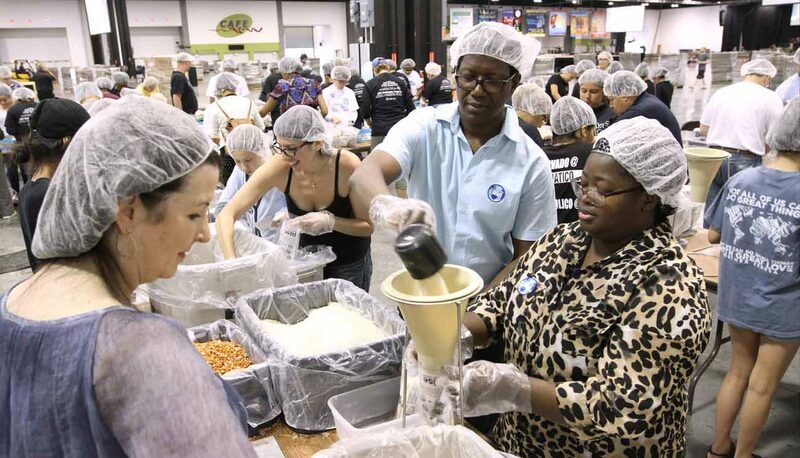 The congress opened with an effort for those in need — dubbed Starve Wars II — and 100,000 meals were assembled for the West African nation of Burkina Faso by teams made up of family and parish groups, co-workers and individuals. Nearly $30,000 was raised for the hunger project associated with Catholic Relief Services, the U.S. bishops’ overseas relief and development agency, and the archdiocese’s Justice and Peace Ministries. “We firmly believe that receiving the body and blood of Christ, then caring for the most poor and vulnerable is living a full, Catholic, eucharistic life, which is what we have been called to do,” she said. That evening more than 3,000 people attended the opening Mass, and afterward people had the opportunity to receive a healing prayer at a service. A full day of congress activities June 17 began with an eucharistic procession of about 10,000 people. They gathered outdoors in the convention center parking lot — which reached capacity at 9 a.m.
For more than an hour, groups from parishes, missions, schools, ministries, religious and lay congregations flowed into the convention center in College Park carrying over 100 banners, some playing drums, singing, swirling flourishes of streamers, or rattling the beaded leggings worn by matachines dance groups. When the procession ended, Archbishop Gregory carried the monstrance with the Blessed Sacrament into the hall. There is pressure in this country to exclude people and keep people out and to treat some lives as expendable, the cardinal said. This means they also are excluded from the eucharistic meal. They need to be on the hearts and minds of those at the Eucharist, he said. “We wouldn’t be faithful to the reason God sent Jesus if we didn’t worry about those who weren’t here,” said the cardinal. Humanity found it “too risky to believe” in God’s initial covenant of love with them, he said. When that covenant was refused, God “kept trying” and came himself to “live humanity to its depths,” Cardinal Tobin said. “We scarcely can believe it when we hear, ‘Body of Christ, Blood of Christ.’ We say, ‘Amen.’ Count us in,” the cardinal said. The day’s program then diverged into tracks with speakers in English, Spanish, Vietnamese and American Sign Language and those for middle school students and young children. A concluding Mass for the vigil of Corpus Christi was celebrated that evening to close the congress. Throughout the day, an adoration chapel was open and confession was offered in various languages. About 400 volunteers served in dozens of roles to keep the event flowing. Congress attendees included Father Duvan Gonzalez, parochial vicar of St. Joseph Church in Dalton, who joined his parishioners on a two-hour bus ride to the convention center. Some came by car. The Dalton group numbered about 120. “They are very, very happy because in this meeting they understand the church is big and has diversity,” Father Gonzalez said. From one of the northern-most counties of the archdiocese, he said the congress plays an important role for families. “We need to continue it, to support it, to invite the community to participate each year. It is beautiful to see so many, many children with us because in this way we teach them what is the heart of the Catholic Church — the Eucharist,” he said. How to strengthen the family as the domestic church — and how to pass the faith to the next generation –concerned both speakers and those attending. Brandon Vogt, author and content director for Word on Fire Catholic ministries, spoke of drawing young adults back to the church by being genuinely interested in what barriers may be keeping them away and seeking answers to their concerns and doubts. “The church doesn’t nag somebody to fall in love with her. She proposes,” Vogt said. He also advised giving “seed gifts” of small booklets, prayers, music or other aids that can touch those who are searching when the time is right. Prayer and fasting must be the foundation of any effort to draw people back to the church, he said. She finds the congress a nourishing and encouraging event. Archbishop Gregory drew on the theme of family in his homily at the closing Mass for about 10,000 people. Families experience quarrels, and even in the church, quarrels take place about the Eucharist itself, such as whether to kneel or stand and whether to receive holy Communion in the hand or on the tongue, he said. When the church of the Atlanta Archdiocese gathers each year for the congress, native dress, songs and languages may differ “but all pale in comparison to the gift that unites us,” the archbishop said. Keiser is editor of The Georgia Bulletin, newspaper of the Archdiocese of Atlanta. Archbishop Gregory – a man blessed with a vision that initiates action.